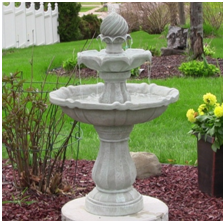 Concrete bird baths are a popular way to attract birds and add extra flair to your backyard. They are abundant and available at many garden centers, lawn ornament stores and major retailers. 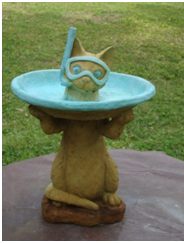 If you take a peek online, you will find a wild assortment of creative and innovative versions of concrete bird baths. 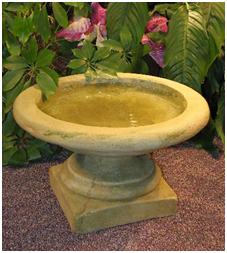 Pedestal bird baths have been the most popular for years, and the molded variety come in a huge array of styles and designs. They typically have a concrete pillar base and some have a detachable basin. More people love the ground level concrete bird baths with a more artisanal type of look. These types come without the pedestal. Basic gray may have been the color of the past, but with designers thinking ‘outside the box’ more colors and more whimsical themes are appearing. Artists are using mosaic chips and animated characters to lighten up the basic concrete pedestal bird bath. The staggering range of bird bath interpretations begins at simple to elaborate designs such as roman architecture or natural themes. As far as finding one you like, this should not be too difficult, as surely one is going to ‘speak’ to your own unique personality. While they are easy to find and are considered quite convenient and durable, they do carry pros and cons of owning one. Before stopping by one of those landscape nurseries and purchasing one on a whim, learning the advantages and disadvantages may help you choose the right one for your needs. Weight: Concrete bird baths can be extremely heavy making them difficult to reposition or clean. Texture: Concrete can be very porous, so the bath has to be cleaned often to avoid algae. Leaks: Because of concrete's texture, it can also develop leaks during rough weather. Weather: Will not sustain a bird bath heater well, could crack foundation of bird bath. We do have our latest favorites. Maybe it is because of the timeless simplicity or their subtlety; the following two bird births have our hearts. While one offers a quiet corner and attracts the shy birds, the other one proudly uses an innovative solar technology to operate. Prairie Bird Bath MISSION Birdbath Concrete 16" GRAY CEMENT Outdoor GARDEN Statue is quietly eloquent and promises to get better over time. The finish is an antique stain which permanently changes the color through a natural process. The bird bath becomes of unique character as it ages, developing a patina (its own darkening). 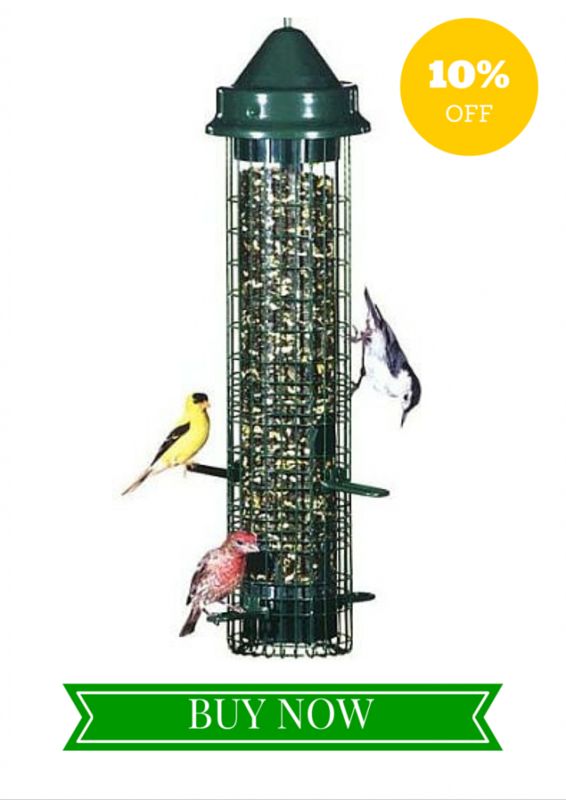 This piece is perfect for birds and can be used in almost any climate. Now you can opt for the latest in bird bath décor. 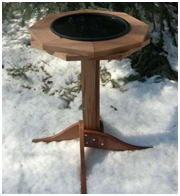 How about an outdoor solar-on-demand bird bath for your garden or yard? This beautiful two tier bird fountains by Sunnydaze operates solely on solar and battery back-up power. The batteries are recharged by solar energy. It is an easy to operate system. The battery can run for up to 4 hrs overnight or on cloudy days. When the battery power is depleted, the system automatically switches back to solar power. The technology for this bird fountain provides consistent performance even in cloudy conditions. The fountain is made of a durable resin material, not entirely of concrete, and weighs only 30 pounds. This addition to your landscape is innovative to provide feathered friends fresh water all year long without any hassle. A one year warranty is included. A concrete bird bath will last for many years provided it is well cared for. The biggest concern with concrete outdoor products is the growth of algae, or the cracking in cold weather. Clean the bath regularly using a stiff brush and a bleach solution to combat algae growth. Rinse the bird bath completely to rid of bleach, then allow the bath to thoroughly dry in the sun before refilling. Discourage algae growth by placing the bird bath preferably a level area offering some shade. Avoid high activities areas where the bath could get bumped and become unbalanced. Cold temperatures can wreck havoc on concrete due to expansion and cracking. Invest in a inexpensive bird bath heater to solve the problem and still be able to offer fresh water to your birds in the winter months. How do you attract birds during the winter? Of course, water is the answer. Open water sources become way more difficult for thirsty birds in the cold winter months. Being able to provide water in the winter may be considered even more important than in the summer. In fact, you can not underestimate the value of providing this necessary resource to birds in the winter. Most bird lovers relish in placing feeders and baths out in their backyards, even offering a variety of different kinds of seeds. 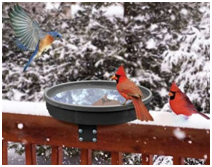 Even the most experienced of bird watchers may not understand the need to add a bird bath heater for cold seasons. Did you know much of a bird’s energy is used up searching out water sources in winter? By adding a heated water source you are doing a great service to the birds as a bird lover. Not only this, you will attract a wide variety of birds, even uncommon ones, to your bird bath heater. This is a good way to introduce new birds to a new feeding environment as well. There are two options available for helping with a good supply of fresh water for your bird bath feeders, let’s take a look at the best bird bath heaters. 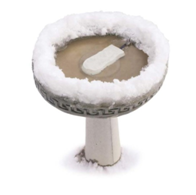 To keep water supply open and easy to access for your birds during the winter months is simply to add a de-icer to your existing bird bath. Be sure your bird bath is approved for a de-icing capability, as not all are equipped for this feature. Concrete should never have any water in it. Other materials can crack with expansion or contraction. If you are unsure, consider the options below for an all-in-one bird bath heater. This ice eliminator is a best seller due to the solid aluminum housing which will keep the unit from being pulled out of the birdbath. Designed to look like an attractive flat rock, it will blend into any birdbath naturally. The big deal about this ice eliminator is it won’t burn or melt any birdbaths, or start a fire if pulled from the bird bath accidently. 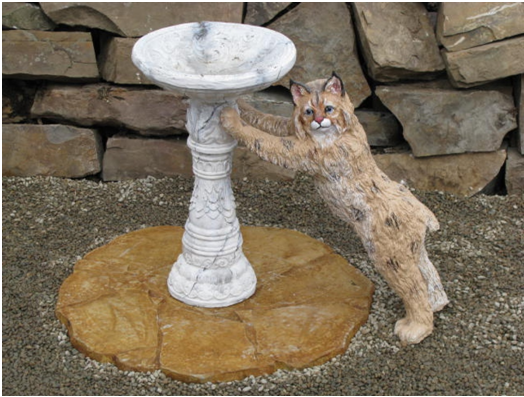 Other features include it being rust-free and it will not leave stains anywhere in your birdbath. 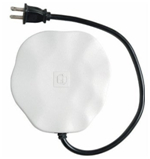 You can get the K&H Ice Eliminator in either a 50 watt or 80 watt for larger birdbaths. These products are MET safety listed and come with a three year warranty. You can’t beat the price at $26.00. K& H makes many other ice eliminators, some which are submersible and some are floatables. This is an ice eliminator which is constructed of cast aluminum and also finished to resemble a decorative rock. Thermostatically controlled, it only operates when necessary. The maximum output is 75 watts, making it a safe choice for all birdbaths. At $36.43, it is a solid economical choice for an already existing birdbath which requires just a simple heater to keep water from freezing. The quintessential thing to remember about bird bath heaters is you are going to need a power source. Most new homes offer an already installed GFCI on the outside of the house (the ‘plug in’ used for outside electrical tools). If your home isn’t equipped with one of these, they are fairly inexpensive and every home should have one regardless. The next best way to keep fresh water available for birds in the winter is providing a complete bird bath heater unit. The heating element is built directly into the bowl. This is super convenient when winter arrives, and you don’t have to keep checking on the status of your water in the birdbath. There are a variety of these types of all-in-ones available. Some clip right onto your deck or fence, and others take on a more traditional pedestal style. Although this is a bird bath heater you have to assemble lightly, it is amazingly well put together with a 60 watt thermostatically controlled and insulated heating element which is sealed inside. The beautiful double ring heater operates down to -200 F. The birdbath is 1-3/8” deep and 14-1/4”in diameter, making it eye-pleasing as well as a life-saver for winter’s thirsty birds. The electric cord is hidden safely in the hollow post and there are 4 hold-down stakes. Another great Songbird product is the attachable bird bath with heater. It is smartly versatile with 3 mounting options: clamp mount, ground use or deck mount. There is a built-in 75 watt heater which will keep the water from freezing until -10 degrees Fahrenheit. The cord will tuck away during the warm weather months. 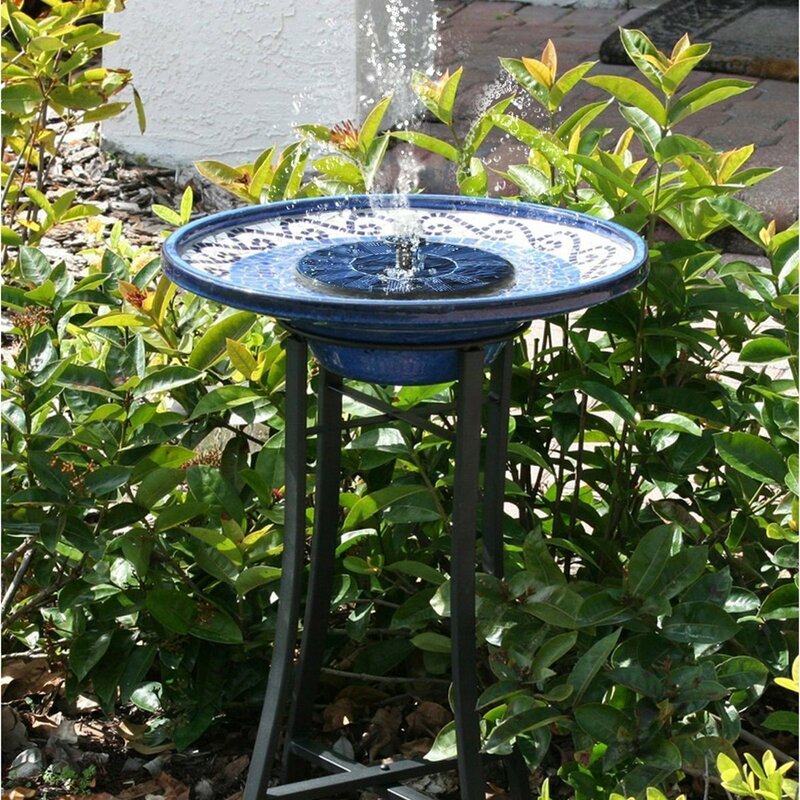 This versatile bird bath will hold over a quart of water, keeping the shallow level safe for the birds. At $57.40, this popular bird bath all-in-one remains high in demand on Amazon. Remember, some of even the best bird lovers are unaware of how important it is to have a heated bird bath/water source for their feathered friends in the winter. These make perfect gifts for the bird lover.